We know it’s not always easy to determine your child’s ski level, yet it’s really important to ensure your child is in the right group. Find your child’s ski level with our handy guide and videos to help place them in the right group. Then, once you’ve determined the right level see what children’s lessons we can offer. Looking for lessons for your teen? Our Pro Rider teen lessons require an adult level 6 ability. You can find the level 6 requirements here. I can already take lifts (drag/chair) and ski green runs doing good plough turns. Arrows standard but 5-7yrs only. I can happily bomb down blue runs but my skis aren’t always parallel. I can already ski parallel turns down red slopes. I am a strong parallel skier that can ski on all pistes without any trouble. I want an adventure and to master all types of terrain and conditions. Still not sure? Scroll down to view our children’s level guide videos, as well as a further description of each level. What we’ll learn: How to manoeuvre around in ski kit and how to ski. That skiing is fun. That we can do it, and that we want to do it again next year! The award for Whippersnappers: For having a go we will get a polar bear badge and if I can slide in a straight line, stop and walk around with skis on I will get my 1*. Wallabies is for first-time skiers from 6-12 years old. Usually, we get to grips with skiing pretty quick and after a week of lessons, it’s not uncommon to see us tackling blue runs with confidence. What we’ll learn: We’ll learn how to plough turn and ski on a nursery, green and beyond. We’ll also figure out how to take lifts safely. The award for Wallabies: If I can glide and stop I will reach the 1* but if I can plough turn and take lifts then I will get a 2*. It has been known for super Wallabies to get a 3* after a week’s work! Arrows is when we have already skied a week, can take drag lifts and have covered the basics already. We may be a bit shaky on the first morning but it won’t take us long to get going. We’ll be ploughing around the green runs having fun before moving onto bigger and better things! 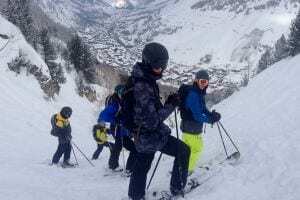 What we’ll learn: To be confident in the mountain environment, on lifts and be able to ski in a strong and controlled plough on green runs and move towards getting rid of the plough to allow faster skiing on tougher blue slopes. The award for Arrows: If I can ski green runs doing plough turns I will get a 2* award but if I can finish the turn and match my skis together all the time then I get a 3*. Being in Bombers is about loads of fun, bumps, jumps, and bombing around the mountain. We’re quite happy zooming around on blue runs and during the week we’ll aim to get our skis to parallel so that we can start to ski like a real expert. What we’ll learn: Learn to parallel ski. The award for Bombers: If I ski well but keep a small wedge when I do my turns, then I’ll get a 4* badge. If I manage to make turns where my skis are totally parallel then I’ve earned my 5* badge. A Rocket can already do parallel turns. In the Rockets we’re going to test those parallel turns on red runs and maybe have a shot on some blacks. Say goodbye to wobbly skiing as we become confident ski demons able to tackle tough slopes and tougher terrain with ease. What we’ll learn: Learn to parallel ski on reds, use our poles and ski a whole variety of terrain from reds to blacks to bumps and jumps. The award for Rockets: If I can ski some great parallels and pole plant then I will achieve a 6* and if I can keep these parallels going no matter what terrain, then I will be a 7*. Freeride is for kids who are already excellent parallel skiers on all pistes from green to black. Freeride is all about knowing the technique and tactics to tackle any piste expertly mixed in with a good dose of negotiating all sorts of mountain terrain from bumps to powder to steep runs to jumps and gullies! What we’ll learn: We’ll make solid skiers able to tackle all the mountain has to throw at you. The award for Freeride: Normally 7-8 on the Snowlife award system but we sometimes swap the badges for something cooler!